First published in 2010, I have only recently got round to reading Doug Saunders‘ excellent review of cities as the great engines of migration and, where successful, the route for the rural poor to achieve a better life and join the ranks of the middle classes. 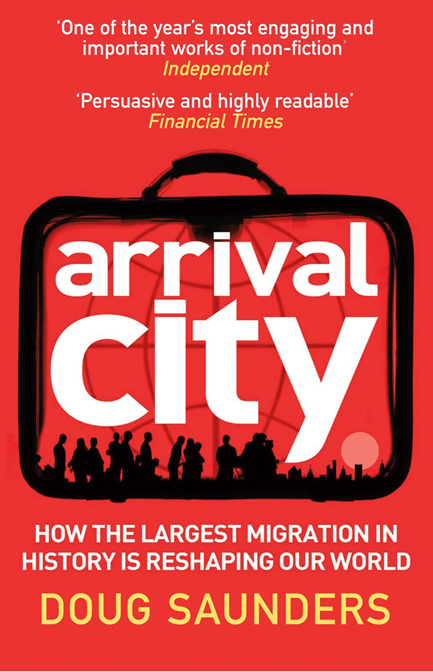 The ‘Arrival Cities’ are the urban districts (often termed slums) with concentrations of rural immigrants, with Saunders drawing on a wide set of case studies such as Tower Hamlets, Shenzen, Mumbai and Sao Paolo. In each case he tracks the lives of individuals making the leap of faith from villages, and how the relationship between city and village evolves. Success for an arrival city, in terms of achieving social mobility, Saunders argues relates to the strength of local communities in arrival cities, and the ability for immigrants to start new small businesses, get jobs, and eventually gain citizenship. Saunders is critical of several examples from Western Europe where local jobs and ultimately citizenship are unobtainable as a result of policy and local circumstances. Policy is widely different between countries, with the most extreme example in China where millions of migrant workers are denied basic services and ability to own property outside of their local area. The physical form of districts can also be significant, where design prevents local shopping and business centres emerging, such as characterise the Paris banlieues. There’s a strong element of Jane Jacobs in Saunder’s argument, with his support for more organic urban districts and local businesses. The urbanisation of billions of rural dwellers is surely the great urban story of the 21st century. This book provides an engaging overview of lessons learned from past and current arrival cities for how this great change in global geography can be facilitated.